This page of the Bookshelf tutorial shows how the sample app stores persistent data, metadata for books, in Google Cloud Datastore. The sample code for this step provides examples of how to create, read, update, and delete (CRUD) data stored in Cloud Datastore. This section uses code in the 2-structured-data directory. Edit the files and run commands in this directory. Set the value of DATA_BACKEND to datastore. Cloud Datastore is a fully managed service that is automatically initialized and connected to your App Engine app. The first time you use Cloud Datastore in a project, you must open the Datastore page in the GCP Console and select Datastore Mode to initialize the service. No further configuration is required. Now you can browse the app's web pages and add, edit, and delete books. The application stores all persistent data in Cloud Datastore. 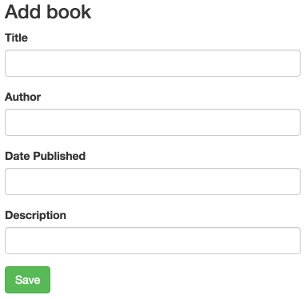 The add/edit HTML form allows users to add and edit book submissions within the app. When a user clicks Add Book, the crud.add view displays the form. When a user fills out the Add book form and then clicks Save, the same view handles the form's HTTP POST action. This initiates the process of sending the submitted data to Cloud Datastore by passing the data to the get_model().create function. The bookshelf/model_datastore.py file contains the code that performs CRUD functions for data stored in Cloud Datastore. For example the get_model().create statement calls the create function in bookshelf/model_datastore.py, which sends the user's submitted data to the update function. A null value is passed in the first parameter, which indicates that this is a new book submission. Here is the update function that does the actual work of saving the user's submitted data to Cloud Datastore. After users have added books, clicking the Books link navigates to the /books page, which list all the books currently stored in Cloud Datastore. The model_datastore.list function does the work of listing all the books using data retrieved from Cloud Datastore. This code queries the datastore using datastore.Query and gets all Book entities and returns them ordered by title. You can also apply filters to queries. See the Datastore documentation for more details. We use query.fetch to get an iterator the query requests. We get results one page at a time and return a cursor to allow the user to load the next page of results.